Prepaid connections are a boon for those who don’t want to get into the hassles of remembering to pay monthly bills on time. Advantage of prepaid connections is that you don’t have to pay the monthly rent which the postpaid users have to pay. The downside of having a prepaid connection is that you always need to keep a watch on your prepaid balance. There are instances when the telecom operators cheat and loot you off your prepaid balance. Or sometimes it happens that you keep making calls or keep using mobile data without being aware of the available balance or data in your account and then keep wondering where did all your balance vanish. There arises a need when you need to track your prepaid usage, be it voice calls or mobile data. 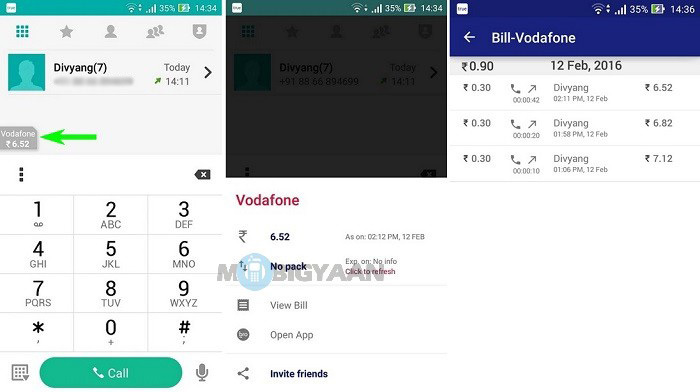 What if we tell you that there is one such app which lets you track your prepaid usage? 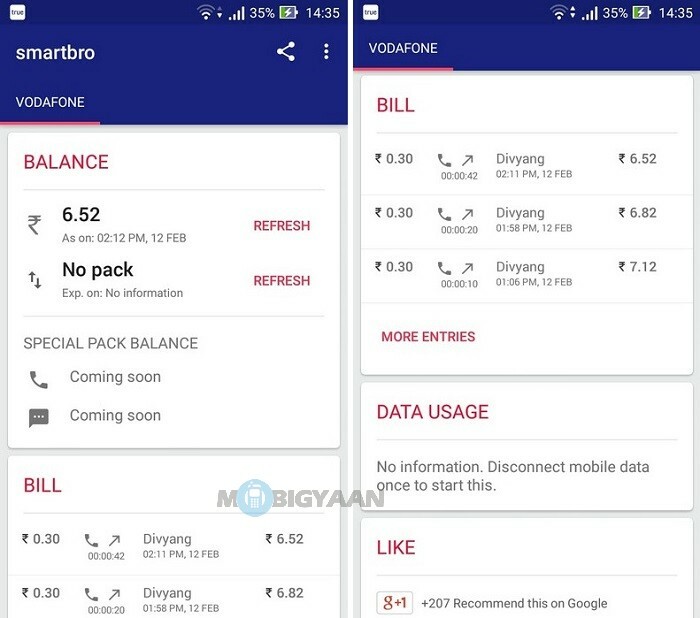 Download the ‘smartbro Prepaid Tracker‘ app from Google Play Store. 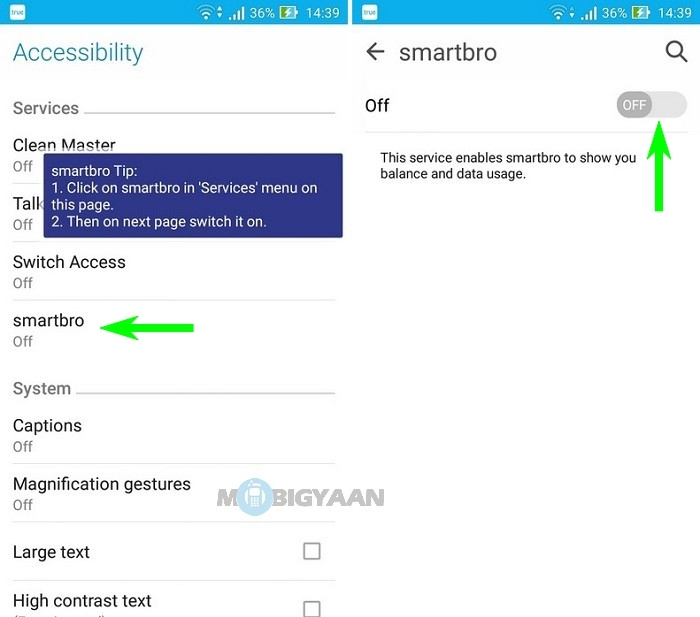 As soon as you download the app you will be taken to the Accessibility settings where you will have to enable the smartbro app from under the ‘Services’ option. As soon as you are done installing the app and enabling it from Accessibility settings, it’s time for you to configure the app. First of all, you will have to select whether your connection type if Prepaid or Postpaid. We select the Prepaid option as this tutorial is aimed at Prepaid connections. 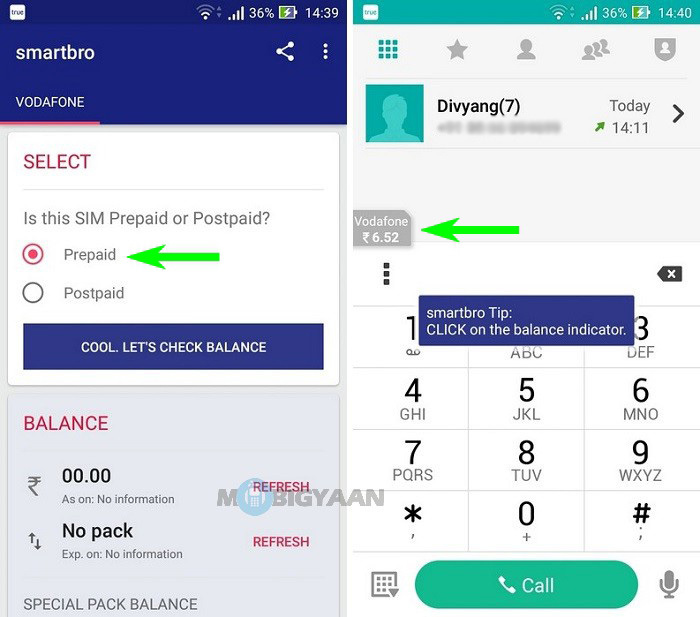 After selecting the Prepaid option, smartbro will ask you to check the balance. It will take you to the Dialer where your telecom operator’s balance check number will already be typed in. After the balance check has been done the first time after installing the app, a small grey colored SIM card will appear which is actually the balance indicator. 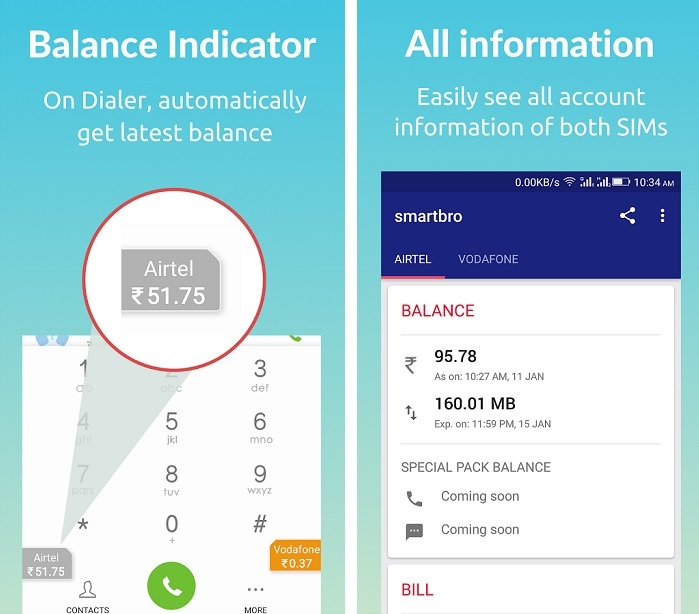 The balance indicator shows the name of telecom operator and the remaining balance. You can change the settings of the app by tapping on the three-dot menu on the upper-right corner of the app. 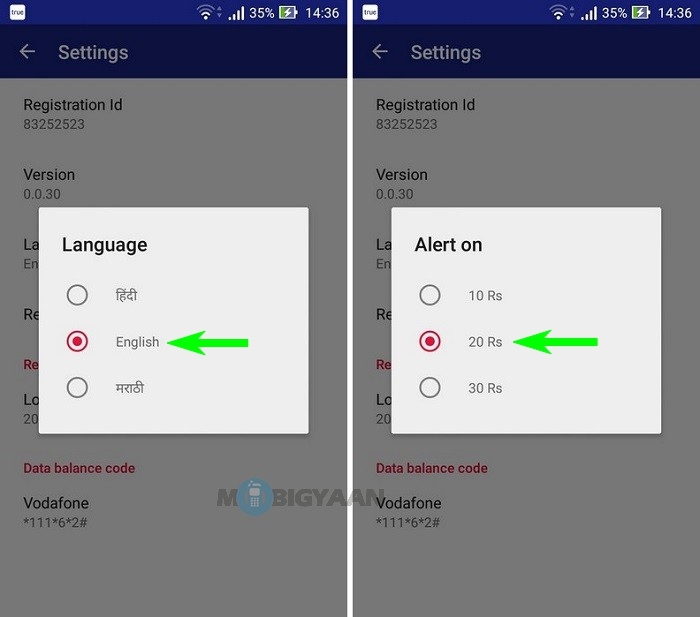 English is the default language of the app, but, you can change the language to Hindi and Marathi as well. This app also allows you to set the reminder for low balance. Tap on ‘Low balance alert’ and it will present you with three options – Rs. 10, Rs. 20 and Rs. 30. Select the one which is appropriate for you. If you want to change the position of the balance indicator, you can do that as well. Just tap on ‘Reset indicator position’ and the app will take you to the dialer where you can change the position by dragging it at a position suitable to you. You can also move the balance indicator from dialer itself without having to go to Settings. 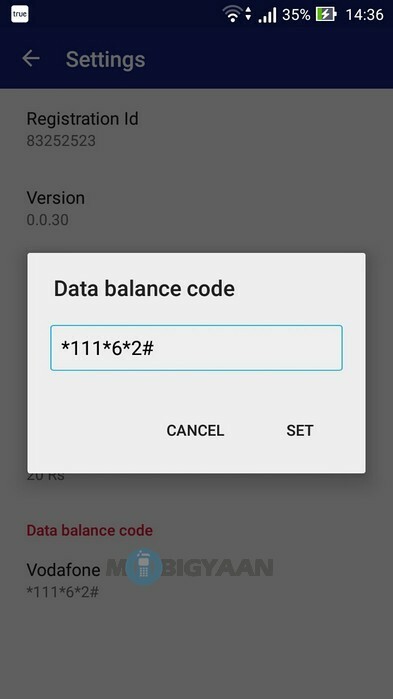 You can also change the balance check code for your mobile data usage by tapping on telecom operator name presented below ‘Data balance code’. 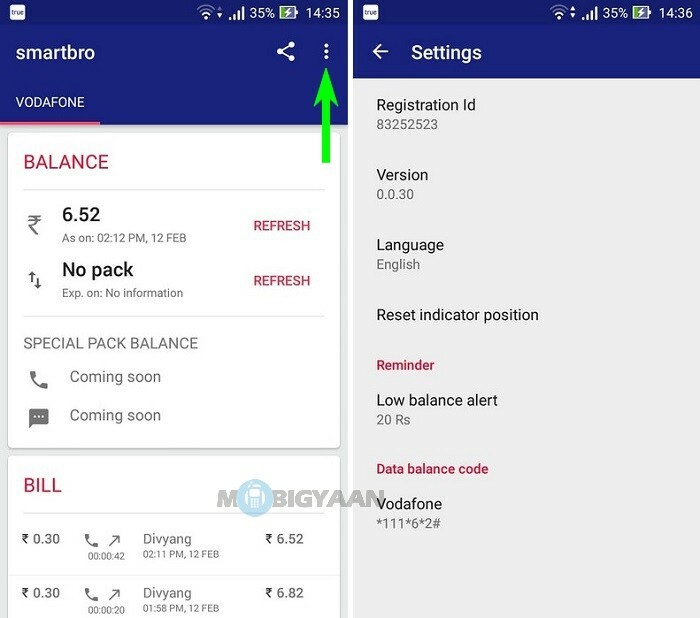 Your prepaid balance is shown by the balance indicator at all times when you open the Dialer app. You can tap on the balance indicator if you want more details of your usage. Upon tapping on the ‘View Bill’ option, the app will show you all the voice calls that took place after installing the app. It shows the time and date of outgoing call, its duration as well as the cost. All this is shown along with the latest remaining balance in your prepaid account. This app lets you track the usage of your mobile data. It also shows the details of ‘Special Pack’ if any. Although this feature is under development and will be rolled out soon by the developer. With smartbro app you can track your prepaid usage and avoid getting conned by your telecom operator. This is a free app and can be downloaded from Google Play Store, click here to download it. 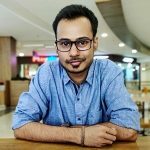 If you are not a prepaid user and have a postpaid connection, worry not, head on to our How to monitor postpaid usage on Android phones [Guide]. You can also visit our How-To Guides section for more such helpful tutorials. Let us know if you found this tutorial helpful in the comments below.